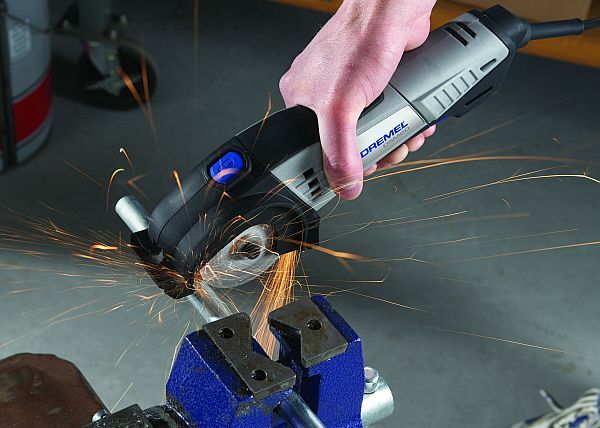 The DSM20 is the latest in Dremel’s outstanding line of Versatile Tool Systems. This ultimate compact saw has a powerful 710-watt motor and makes cuts up to 20mm deep in the most common materials from wood to plastic, metal and tile. The Dremel DSM20 will make short work of any maintenance or repair projects with its excellent line of sight and abrasive cutting wheels helping to achieve precise cuts. Powerful enough to cut through virtually any material and simple enough to be able to control with one hand, its compact size and ergonomic design make it easy to handle, easy to follow the cut line, and easy to store. It’s perfect for home improvements such as installing cabinets, flooring, tiling and plumbing, kitchen and bathroom installation – even fitting new stairs, plus of course, for all-manner of automotive-related tasks. The Dremel DSM20 makes a beautifully clean cut compared with toothed wheels, thanks to its abrasive wheel technology. Extremely precise, it requires no lower guard mechanism and is capable of performing accurate straight cuts, flush cuts close to the surface and plunge cuts with no kickback. In particular, its plunge-cutting ability is second-to-none with the lack of teeth on the blades easily cutting into different materials from wood to masonry. It is easy to operate using just one hand for most cuts and its abrasive wheels allow for both push and pull action, whichever is more convenient. Additionally, it’s simple to change accessories using the shaft lock button. The 710W motor runs at a fast 17,000rpm, ensuring there is sufficient power for any task, including tough applications. It also has a depth guide adjustment, making it possible to cut through most materials up to 20mm. The kit also comes with a welcome DVD and a sturdy, spacious storage case. The Dremel DSM20, also known as the Dremel Saw-Max and is available at a variety of retail outlets including, B&Q priced at around £119.98. 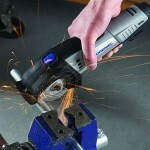 For further info visit: http://www.dremel.co.uk ENDS. Print article This entry was posted by admin on March 22, 2012 at 7:43 pm, and is filed under News. Follow any responses to this post through RSS 2.0. Both comments and pings are currently closed.